It is a great combo! I’m excited to be part of the Unity and Petaloo hop today. The Unity design team is playing with Petaloo flowers and our favorite Unity stamps. You should have arrived from the ever talented Joslyn, if not, all the action starts on the Unity blog. It was really fun to see how watercolor pencils would work with the Petaloo paper flowers. Quite nice if I do say so myself. I tried two different methods and both resulted in different effects. I created a puddle of water and added the pencil to it for a softer coverage. Then, I applied the pencil directly to the flower and blended with water for bolder coverage. It is easy to add more color once the item is wet, just color lightly over the area that is damp and blend some more. For the flower centers, I dabbed the pencil in dots on top at the end and didn’t blend with water. I let them dry for awhile before adding them to the card. They are delicate when wet and the glue doesn’t work so well either. I really LOVE this Unity sentiment kit. Can you believe it is only $10??? What a steal of a deal. I stamped the label and sentiment on the flower patterned paper. I stamped the sentiment a second time and trimmed out the bold words to pop them up. We’ll be giving away 3 prizes from comments left on the participating blogs. That is all from me, head on over to the amazing Renee next!!!! Beautiful! You rocked the flowers, Lisa! what a great card! Love that sentiment kit so much I had to order it! I’ve got that sentiment kit ordered. Can’t wait til it comes! Wow Lisa! Your card is amazing, and love the way your colored flowers turned out! Love the layering on the sentiment and your flowers are just perfect. What a fun card. I just got this set and can’t wait to play with it! Wow, great card design! Love the colors you chose, too! The flowers are blended so nicely. so pretty! i absolutely LOVE it! Great design! 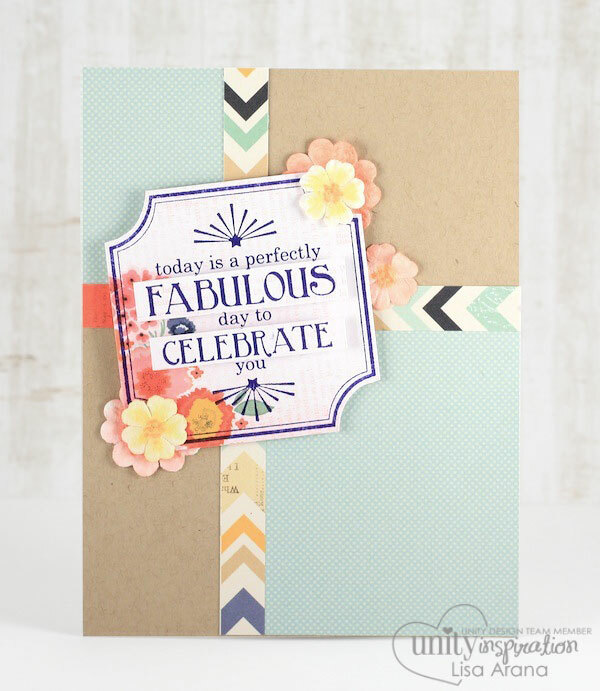 I love that you stamped the sentiment piece on patterned paper and popped out the big words! Such a cheerful card, and pretty watercolored flowers too! Beautiful card. I love your layout and how you tucked your flowers. Very clever idea. Your layout is Beautiful! and very pretty flowers. and great colors too. It add a nice touch! Love the use of the watercolour pencils, great card. Beautiful card! Love how you layered the flowers. Lisa, what a LOVELY card! I love the pretty colors. Love the divided sections on the card. The chevrons really add to the design. thanks for sharing. I love everything about this card. Your technique to add color to the flowers is genius. Thanks so much for sharing. Such a pretty card! Love the altered flowers! Love how you popped up the words on the sentiment! TFS God bless!! WOW! I love that you shifted everything to the left instead of the middle! I will have to CASE that girly! Awesome card!! Such a beautiful card, love the colour scheme you choose! This is beautiful, Lisa! Good to know that watercolour pencils work on these flowers, too. love how you used the paper for the background. Beautiful! Great card with beautiful colors. I like the color blocking, too! Love your technique on adding color to the flowers. I also like how you made part of the sentiment POP! Beautiful card! I love how you popped up part of the sentiment…. Beautiful card! I think I need that sentiment set! Really pretty soft colors on the flowers and a great sentiment! What a beautiful card with perfect Spring colors! Your card is just beautiful! Love how you used pencils on the flowers! Beautiful! Would never thought to use watercolor pencils on the flowers. Those flowers are so pretty Lisa and I just love how you have popped the sentiment too! Beautiful card! Love the bright colors:) TFS! Wonderful, you did a great job! Darling card. I like how you divided it into quarters.